These grip Restraint Mitts are designed to prevent prisoners from picking up anything which might cause harm to either him/herself or detention staff. 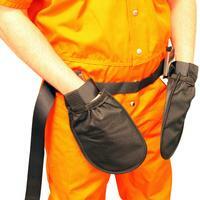 They work in conjunction with the wrist restraints but will also work with standard handcuffs. They are sold in pairs. Thanks to Grip for their picture.